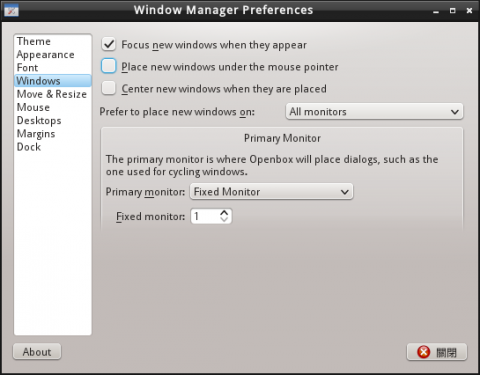 Since we’re using Openbox as our default window manager, we need a GUI way to configure it. Previously, we have a GUI config tool for OpenBox named obconf, which is based on gtk+ 2 and libglade. However, since we plan to use Qt, and gtk+ 2 is no longer officially supported by its upstream, a Qt port is wanted. Hence, as part of LXDE-Qt project, I started a Qt port of obconf and that’s obconf-qt. It’s a pure Qt program so it works as well outside LXDE-Qt. It’s also useful for the upcoming razor-qt 0.6. Most of the original features are already been ported to Qt. Other stuff should work as expected. If anyone is willing to help, please contact me. I see “center new windows..” option, but in last openbox config option for windows placement was removed. So.. maybe i missed something? Would you make LXappearance-qt for customize Qt-stlye, colours and icon theme? Great! I love Qt and its desktop. Qt will dominate the Linux GUI and even moblie devices in the future. Great to see progress. I think it is good for the project to have most of the code rewritten keeping the philosophy intact. Would also be cool to have a LiveCD image with the latest LXDE-QT build to play around! qt looks and feels so much better. i am happy with these evolvements. one thingy though i was just testing pcmanfm qt and noticed it was missing a filter bar.